Below is our market menu for this coming Saturday April 13 Farmers Market in the Baileys Harbor Town Hall - it's the last one inside for the winter season. The season opener for the Baileys Harbor farmers market will be back out on the lawn Saturday May 18 (Scottie Rally) and Sunday May 19 - let's hope it's warmer out! Feel free to pass our menu on to friends. Our web site has a new look and more info so visit us at www.doorcountycherrypie.com or Google us at Door County Kraut Company. 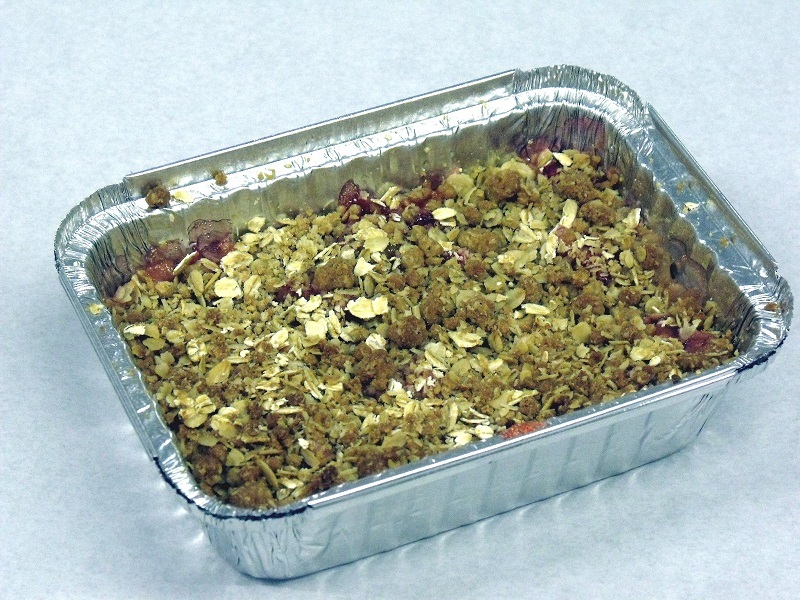 Saturday April 13 2019, Baileys Harbor Indoor Market 10 a.m. – 2 p.m.
Granola: Cranberry-Almond-Coconut* (Gluten Free - No Sodium) 1 lb. bags. Thank you all for supporting our endeavor to bring you home-made scratch bakery and specialty items. Annie & Jimmy at DC Kraut Company – We’ll see you on the lawn out front May 18 & 19 for the summer market season! Our smoked whitefish dip/spread is a local ethnic food with Northern European origins. We use native Whitefish which has a delicate mild sweet flavor, and is not an oily fish when compared to Salmon. Our fish are obtained by us from Charlie’s Smokehouse in Gills Rock where they have been smoking fish for generations. We manually skin and debone the smoked fish then begin the process of making our final product. We produce two flavors of Dip/Spread – Plain and Southwest. Some of the ways our fish dip is eaten is on crackers/chips/raw vegetables, used as a spread on bread, or allowed to melt over hot pasta for a tasty main course or side dish. Original Smoked Whitefish Dip: For the palate of those who desire to partake of the delicate flavor of the smoked fish. Southwest Smoked Fish Dip: For people who want a bit more flavor in addition to the smoky fish, but without the heat that people have come to identify with Southwest. At Door County Kraut we specialize in scratch bakery using heritage recipes from our families, and have been given permission to use old local recipes from neighbors and friends. In addition we have modified and developed improvements on some products. When possible we use products we raise in our gardens and orchard to create value added products when Mother Nature gives us manageable growing seasons. 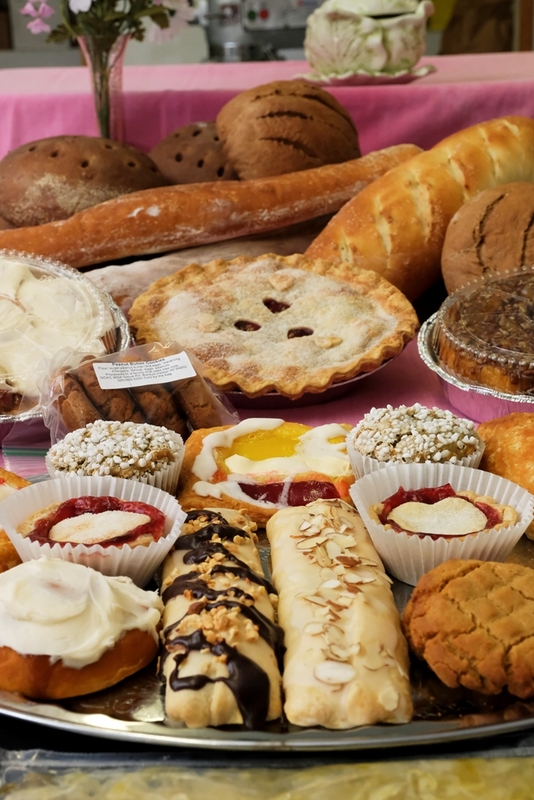 We strive to make your baked goods not only a treat, but many of our items are healthier choices including no preservatives, low sugar and low sodium. Below is just a hint of the wide variety of items we can make. As we are not limited by corporate restrictions being self-employed, we have no fear of the boss firing us for being adventurous in what we do. We work with our customers on their needs. That is what makes the foodie side of life on the farm fun. 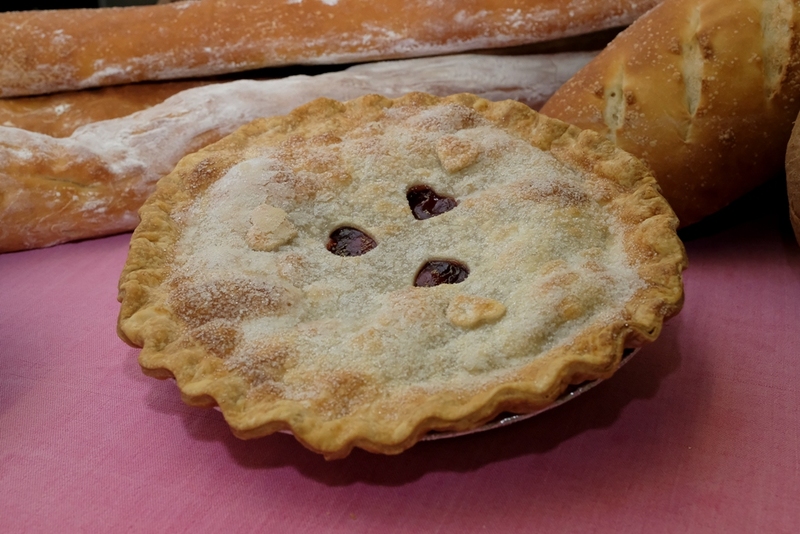 9” pie prices start at $15 each with pricing dependent on type of filling desired, market pricing of filling ingredients, and complexity of the pie making process. 3” pie prices start at $3 each with pricing dependent on type of filling desired, market pricing of filling ingredients, and complexity of the pie making process. Crust Options: Two crust, One Crust with Crumb or Streusel Topping or creative cut-outs from crust dough, Meringue (special order). Size Options: 9”, 3” Handi-Pies© (a minimum order of 6). Special occasion ½ and full sheet pan pies or the Anschutz Family recipe apple or cherry pie squares can be made with a minimum 2 week notice. Filling Thickening Options: Filling can be thickened with either modified corn starch, flour, eggs, or flour & eggs as in our Custard Style Rhubarb, Custard Style Cherry, and combinations of fruits. Fruit Pies: Montmorency Cherry, Apple, Rhubarb, Plum, Cranberry, Blue Berry, Raspberry, Currant, Peach or Pear and other fruits dependent on availability. Combinations of several fruits in a single pie are also available. Frozen Adult Pies*: Grasshopper, Brandy Alexander, Black Russian, Mocha-Vin. These pies have alcohol in them, thus the adult only sales, and are to be eaten frozen like an ice cream pie. Frozen Cheese Cake Pies and Desserts*: Lemon Supreme, Raspberry Cheesecake, Strawberry Cheesecake, Chocolate Cheesecake. *These items can contain fresh uncooked fruit, and/or dairy products that require the finished product to be refrigerated and or frozen. Key Lime Pie contains undercooked eggs which may increase your risk of foodborne illness. We feature many types of pastries, yeast and sourdough based breads, sandwich/dinner rolls, sweet rolls – both conventional and unconventional including the McArdle family’s Maple Pecan Sticky Buns. Our quick breads many utilize our farm fruit, with other healthy ingredients and are lower in sugar than you may be accustomed to. 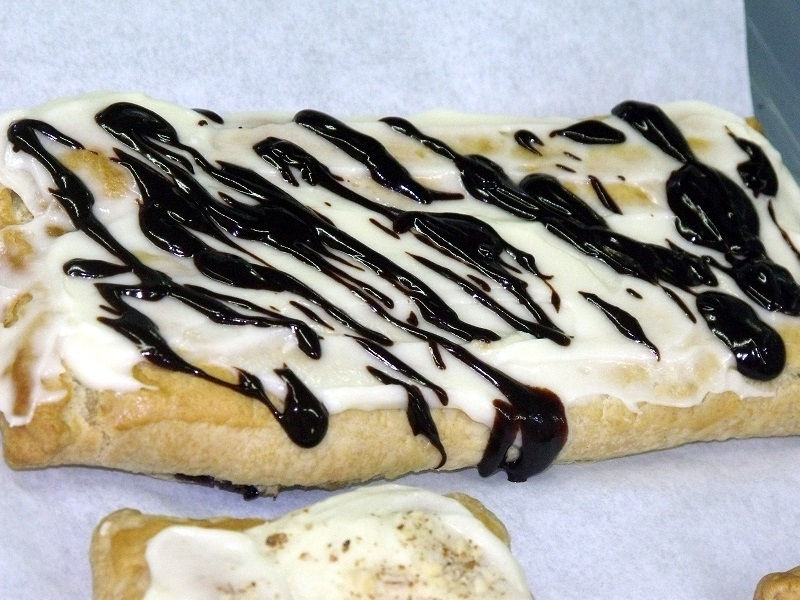 Kringles and Danish are also a mainstay on our menu board. Our Kringles, unlike the Kringles that made big bakeries famous, is one found in my mom’s old handwritten cookbook and making them is a multi-faceted process. 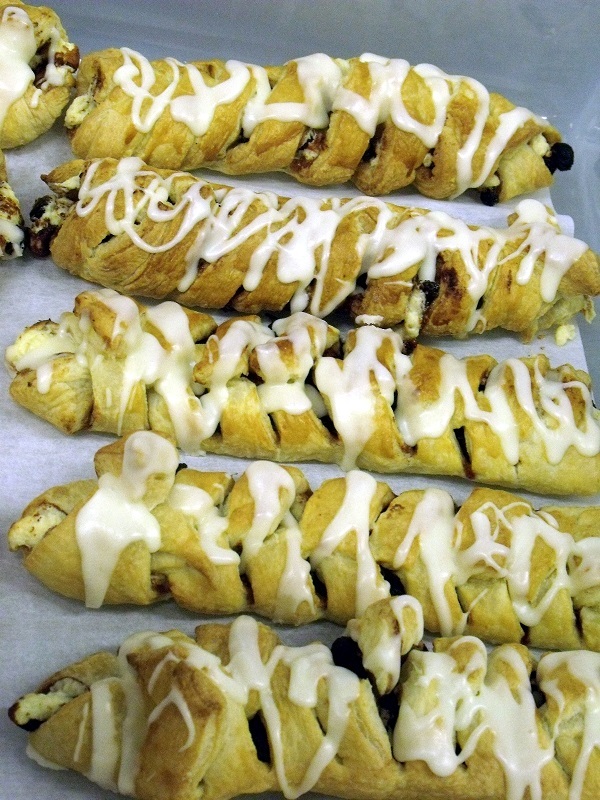 Glazed Almond Cheese filled Kringles are our leading seller, and Red/White & Blue Danish is our most popular flavor. Our sourdough starter originated in Wyoming and was given to Ann at age 10 by Irene and Emery Oldenburg who obtained the starter during their annual vacation to Wyoming. While vacationing, Emery participated in cattle drives and wild horse round-ups where the starter was used daily for making breads and biscuits for the trail hands meals. 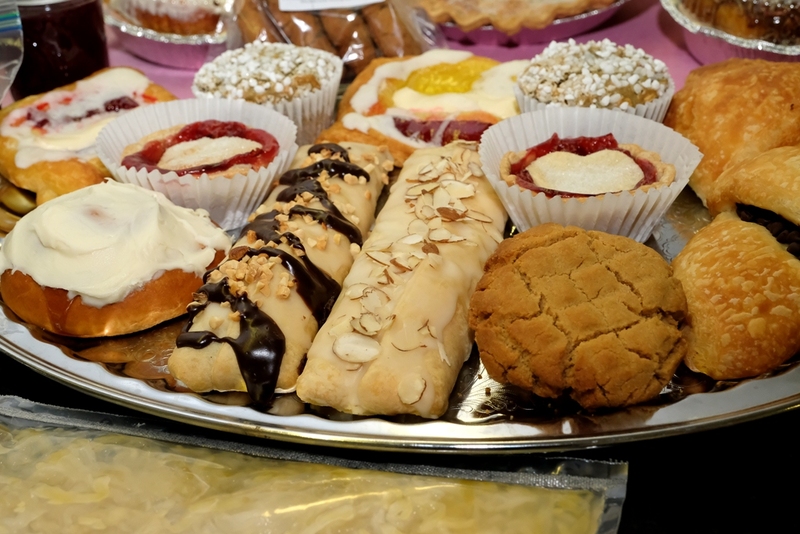 As time, temperature and humidity permit, other bakery items are featured. We have Spelt hard wheat flour on hand to make diabetic friendly bread by special order year around. Left over market yeast breads are used in our herb stuffing. This thaw, heat and serve product is sold fresh or frozen in 1 lb. blocks. We have it on hand at our Grove Rd. location and bring a supply to farmer’s markets. Our current or upcoming market menu posted on this site will inform you of what items are featured at the Baileys Harbor Farmer’s Markets. Many menu items change from market to market, but our customer favorites are a staple item. 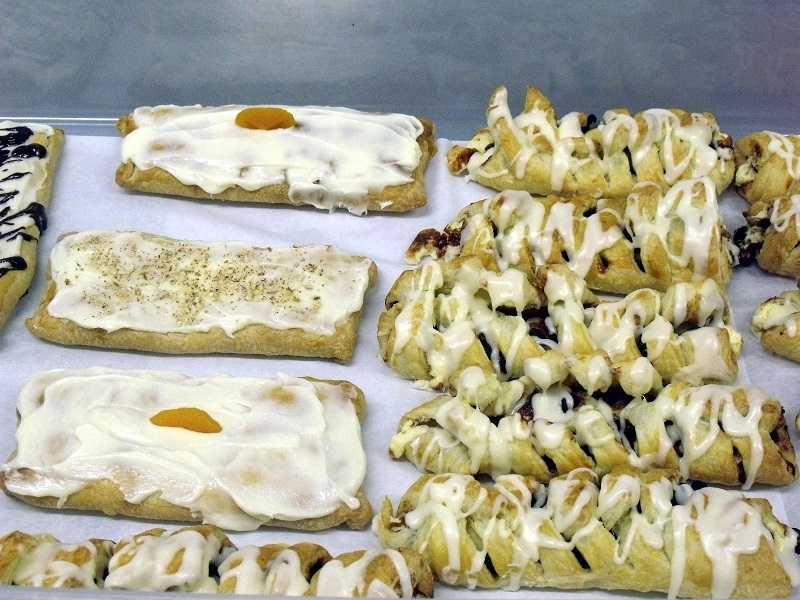 Our homemade Diamond Danish Pastries and Kringles come in various fruit and cheese or cream fillings and combinations. *Available all year with advanced notice - minimum orders may apply. Customer Favorites: German Gingersnaps, Peanut Butter Cookies, Cougar Bars, and Lemon Crisps, Oatmeal, and Molasses Raisin. Some cookies are frosted, others sugared and yet others plain. We alternate these varieties with many other types of cookies and bars throughout the year. Gluten Free folks can choose from French Macarons, Black Bottomed Coconut Macaroons, and Craisin Crunch Bars (CC Bars are bound by glucose-the sugar or wheat and may not be suitable for individuals with Celiac disease). French Macarons are now available as single cookies at the markets although not every week. Special orders and large quantity or multiple batch orders are available and you are advised to give us advanced notice. Christmas Cookies – Sold by the Pound – The Most Wonderful Time of the Year!! Every year we anticipate the Christmas Cookie making season. As a child, Ann grew up with a family that specialized in this family bonding activity producing many kinds of cookies and candies for gift giving and entertaining guests. The treats were well received and Santa always ate all the cookies on his plate – we’re not sure if he shared them with the reindeer or Mrs. Claus. This Christmas past found us featuring 14 types of Christmas cookies, with 3 types being gluten free. New this past year were customers who asked if we had undecorated cookies to sell, and that will be a new item on this coming years’ cookie menu which is ever expanding. Customers may mix and match cookies for a gifting assortments large and small, parties, just allow themselves one cookie for a treat, or target just one or two favorites purchasing multiple pounds for their private secret stash. Whatever your desire –we have packaging suitable for gift giving in various sizes. If you are seeking to purchase large batch quantities of one or a few varieties of cookies we welcome you calling ahead so we can have enough ingredients in place and time to accommodate your special order. The cookie sales have traditionally taken place at the 2nd and 3rd Sunday indoor Farmers Markets at the Baileys Harbor Town Hall, but you can call and stop out to purchase cookies at our Grove Rd. location during the week. Cakes are not sold at all markets due to the intensive amount of time involved, especially in creating multi-layer cakes. I tend to feature more cake offerings at winter markets, sometimes making 4” Baby Layer Cakes, and some single layer 8” rounds. Cake sizes available – 4” to 12” round cakes, sheet cakes, loaf, 9x13, and cupcakes. Layers available: Single layers can be cut into 2 in round, loaf and 9x13”, and 2 single ½ sheet cakes can be made into one ½ sheet layer cake. Cannonballs – the cake pop’s larger cousin. Customer Favorites: Black Forest Cakes, Lemon Poppy Seed, Red Velvet, White, Yellow, Chocolate, Carrot, Banana, Lemon, Orange, Lime in D Coconut, Grandma’s Apple Spice Cake (vegan) and German Chocolate with Broiled Frosting (single layer – limited sizes). Flavors are not limited to the aforementioned cakes as we have an extensive collection of old family favorites and heritage recipes that include Angel Food, Chiffon and many specialty recipes. Cheesecakes: These are special order for pick-up at our Grove Rd. location only due to refrigeration requirements. American Butter Crème is our frosting of choice and is made into many flavors dependent on the finished product desired. Glazes flavors on hand are Vanilla, Almond, and Caramel and are not suitable for fillings between layers. Fruit glazes made from unsweetened fruit reductions can be special ordered, at an additional cost. Streusel, Crumb, Nut Topping, or Chocolate Drizzle over Butter Crème. Footnote: We do not have the specialized equipment to make Wedding Cakes so we suggest Monzu Bakery of Green Bay and Tamara the Cake Guru with locations in Oshkosh and Appleton for your special day.. Bakers at both businesses have won multiple awards in regional and state competitions in numerous divisions. Both are members of the Wisconsin Bakers Association.